Dealing with nagging shoulder pain? Why? The pain is simply telling you there is structural damage that needs to be addressed. If you would address a broken stair on a staircase so your children do not hurt themselves, you should do the same for the damage in your shoulder because it can quickly advance to a merciless and debilitating pain. In this article, we discuss a case example. This is one patient but we see many like her. If you have questions about your own shoulder pain and if there is a better treatment option, please reach out to us to discuss your case. Our clinical team will get back with you today. JM but woke up with pain one morning after sleeping with her arm above her head though she could not recall any particular injury. The pain started as a small, nagging “twinge” but worsened over the following months. When the pain became chronic, she decided to consult with an orthopedic physician. 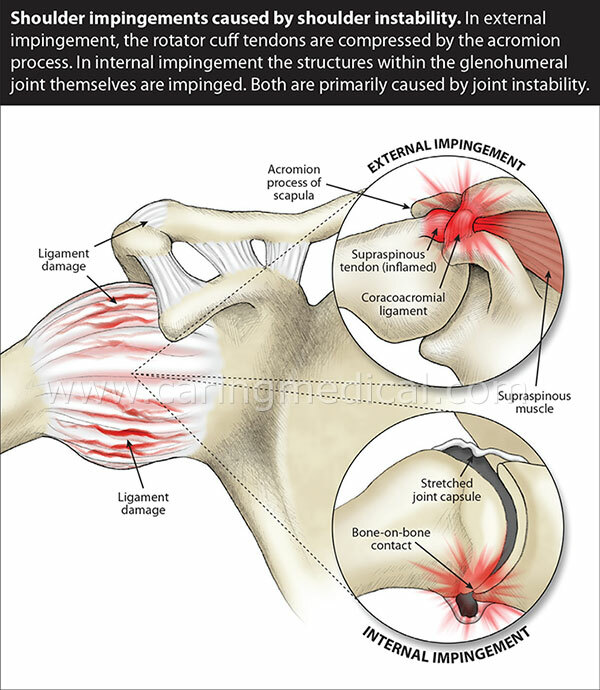 According to x-ray and MRI results, she was dealing with an impingement as well as a rotator cuff tear. The orthopedic performed a cortisone injection which temporarily relieve her shoulder pain. This is the typical recommended course of treatment by an orthopedic surgeon, but it is not ideal for the long-term. In fact, surgeons can often tell the difference between a shoulder that has received cortisone and one that has not because the tissue integrity is terrible after cortisone has been injected! Anyone who does not receive relief from a single cortisone injection should consult with a Prolotherapist before considering a second round as continued corticosteroid injections will needlessly degenerate the tissues. In the case of JM’s shoulder, the pain returned with activity and she found that she could not perform basic tasks such as getting dressed without causing pain that would shoot down her arm. The shoulder pain eventually began to interrupt her sleep! Although she could still play golf on a regular basis, she would often have pain while swinging a club if her form was not perfect. JM wanted to be able to play golf and lift weights without having to worry about making her condition worse! The orthopedic recommended surgery to repair the tear, but JM consulted with Caring Medical for a second opinion and decided she would prefer an alternative to shoulder surgery. She received four rounds of H3 Prolotherapy with Platelet Rich Plasma over a period of three months. Each treatment comprehensively treated around her whole shoulder. 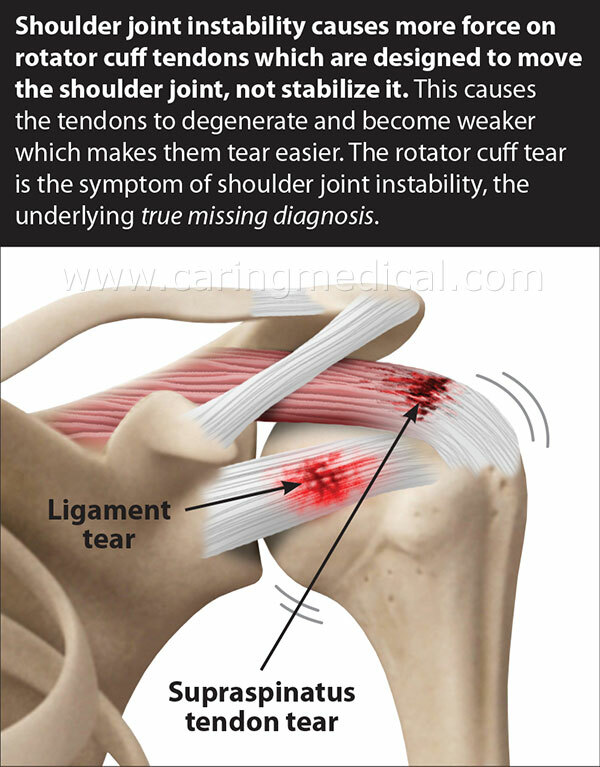 Our goal was to treat the rotator cuff tear as well as the underlying joint instability which had eventually lead to the impingement. 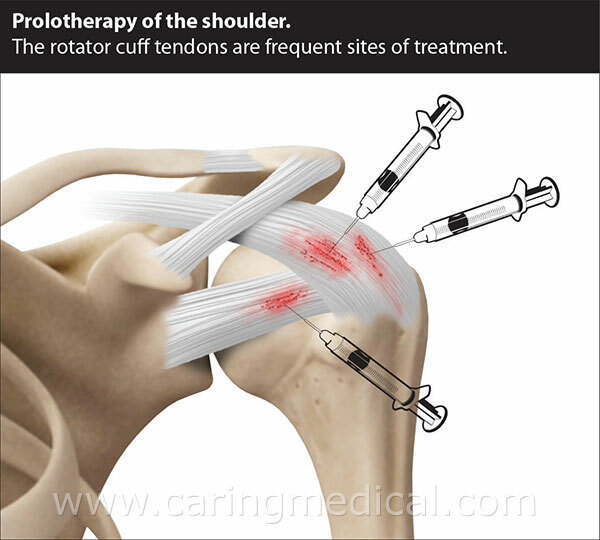 Targeting injections at the rotator cuff tear alone is not enough! JM was also given a tailored exercise program to help her reach her goals. She understood the importance of the treatment plan recommended and remained compliant between treatments. After her first two treatments, JM began physical therapy at the recommendation of the Prolotherapist and continued to improve with each H3 Prolotherapy treatment. Physical therapy can be a helpful adjunctive therapy for shoulder Prolotherapy. We often work with our physical therapists to give individualized recommendations to achieve optimal results. Maintaining motion is important in restoring shoulder joint integrity which makes physical therapists excellent partners for Prolotherapists! We enjoy working together when it is in the best interest of the patient. When a patient is capable of a home-exercise program, we can make the appropriate recommendations for specific exercises. This is all part of our individualized approach to treatment. One month after JM’s fourth treatment, she reported 100% pain relief and was able to return to full activity! Three months after her last visit, she was back to working out in the gym and playing golf without any pain or restriction! 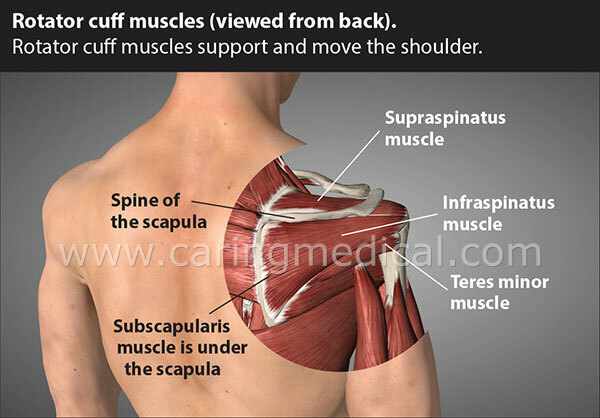 The shoulder is the most mobile joint of the body and has a large support system of ligament and muscle structures to keep it stable. Under x-ray, the shoulder joint resembles a golf ball on a tee. A few weeks after an injury, the body loses the ability to repair soft tissue which supports the shoulder. Once ligaments are overstretched, an over-reliance on the muscles to stabilize the shoulder can lead to a rotator cuff tear. This vicious cycle can quickly become a degenerated mess.